CLICK HERE for your Corner Bakery coupon. 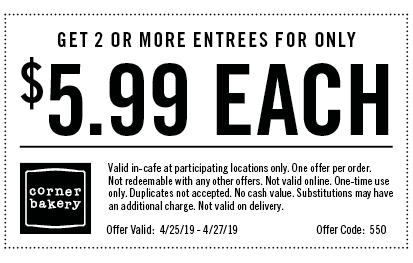 Get two or more entrees for only $5.99 each with the coupon. Valid in-cafe at participating locations only; not valid with online ordering. Corner Bakery announced the special in This Email. Also at Corner Bakery get a coupon for a free bakery sweet when you enroll in their email club. To enroll and get your Corner Bakery coupon CLICK HERE. Corner Bakery Cafe is an American chain of cafes that specialize in pastries, breads, breakfast dishes, gourmet sandwiches, homemade soups, salads, and pasta. Corner Bakery Cafe is considered to be a part of the fast casual market segment of the food service industry, offering a somewhat higher quality of food and atmosphere than a typical fast food restaurant, and offering limited table service. The cafe has 192 locations nationwide, including in Miami, Los Angeles, San Francisco, San Diego, Chicago, Houston, San Antonio, Dallas, Austin, Philadelphia, Pittsburgh, Atlanta, Denver, Salt Lake City, Phoenix, Tucson, El Paso, Baltimore, Washington, D.C., Tampa Bay and Buffalo metropolitan areas, as well as in Northern California, Mississippi, New Jersey, Virginia, Savannah, East Texas, and the Rio Grande Valley areas.